Lessons learned and observations made in the first two attempts at making encaustic paint in six years. In attempt one, I tried to melt the damar resin then mix the wax into the liquid. The resin wouldn’t melt in a double boiler, so I transferred it to direct heat on the hob and promptly burned it (whoops). On the second attempt, I added the damar crystals to the wax. This was more successful (i.e. : they melted without burning) but the damar crystals didn’t fully melt into the wax and I became concerned about leaving it on the heat too long, in case the wax started to discolour. WaxSmashing the resin crystals to reduce their surface area would almost certainly help, but that carries the risk of airborne particles – not a good thing while I’m still using the living room as a studio and sharing the space with my asthmatic partner. Under my current working conditions, I’m not convinced that direct heat is the wrong way to go, but it clearly requires a more cautious approach. On the first attempt, I added the wax in one go. In hindsight, this was clearly a bad idea. On the second attempt, I added it in four lots, which was far more sensible. Elementary stuff but, since I messed it up the first time, it bears documenting. I poured the result of the first attempt into a metal food tray and found that it stuck to the sides of the container as it dried. Getting it out will involve either destroying the container or melting the whole block and decanting it into a more suitable receptacle. 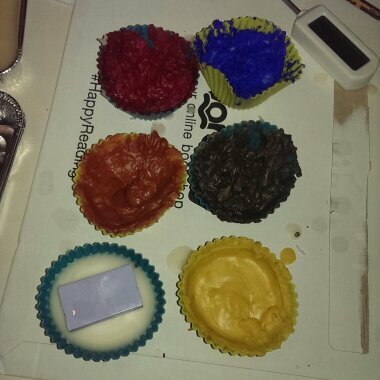 The result of the second attempt went into silicone cupcake cases. These have been far more forgiving, and the wax cakes can be removed easily. Definitely the way to go in future. I added colour to the second batch in the form of oil paint, which had been squeezed out onto kitchen roll to draw out some of the oil. The paint was laid out in approximately 1.25 inch lines and left for a little under 48 hours. I mixed this into the wax while it was still cooling in the silicone moulds and, after some mashing, it mixed fairly well. There are some issues with the distribution of the pigment which is particularly evident in the paints made when the wax was cooler and they’re none of them as pretty or as bright as shop-bought paints, but they’re functional and significantly cheaper. Measuring the wax by volume seems to be the way to go. The stickiness of the first product was unappealing and, although it could have been caused by any number of factors, weighing the wax and resin is more time-consuming and doesn’t offer noticeably better results. 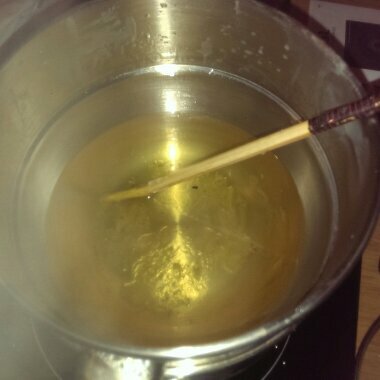 Melting the wax (in batches!) before adding the damar was not an unreasonable thing to do, but I’m conscious that the wax changes consistency and colour as it gets hotter. I’ll need to do some reading on the properties of wax and damar before making a decision on whether to melt the wax or the damar first. Silicone moulds are hands down the way to go if I’m making wax cakes. The Enkaustikos-style tins have a certain appeal, but heating that much wax is going to take a while, and the tin will be a swine to clean if it gets contaminated with another colour. The cakes can be melted individually, cut, weighed and mixed methodically. When making coloured wax, I need to be do it one cake at a time, leaving the bulk of the mixture to stay liquid. The pigment isn’t as evenly distributed and, although aesthetics weren’t high on my list of priorities, the waxes coloured later in the session look like lumps of frosting which will certainly make stacking them harder even if it doesn’t come back to bite me in some other fashion. I’m back from BUCK and running to catch up with the commissions I took, but I should write the con up before I forget what I learned. Although I got the pictures finished early enough, despite having to drop five of the planned designs (this is a good thing. More on that later), getting them printed was a farce. Pro Print were amazing and I’ll definitely use them again. They seem to specialise in doing proper prints rather than posters, though, and the proofs look beautiful in matte with a white border. Travelling up to Manchester, I should have prepared food and water for the journey. It was a hot day and if the journey had been the other way around (five hours, change, one hour), I’d have been in serious trouble. About half-way through the con, I realised that I’d committed a cardinal sin: bringing prints of my OCs to sell at a convention. Almost nobody cared and only a handful who did actually recognised the characters. I ended up giving posters away with commissions just to get rid of them, but still have loads left over. The colouring pages were very well received by other artists, but here were fewer children there than I’d anticipated, so many of the colouring pages came home with me. Like the prints, I expect they’d have gone down better if they’d featured canon characters. They were probably overpriced – they should have been free or thereabouts – and grouped into packs rather than divided by image. My price list was subject to change throughout the convention, partly due to bad phrasing on my part (‘Buy one get one free’ is less direct than ‘two for £x’) but mostly due to changes in price (commissions were massively under-priced at the start) and focus (commissions rather than prints). Despite raising my prices significantly, I took a huge number of commissions. I don’t consider this a problem, but I should have timeboxed each painting and informed customers how long they had to wait. This will come with practice, but I have been left with about a dozen prints to finish and post out after the con. Daniel (with whom I shared a table) was offering ‘pay what you want’ commissions and did very well while I struggled to build momentum. When given the choice of payment, it seems that people will err on the higher end of payments for larger but less detailed commissions. While this frustrated me early on, my smaller commissions were still very popular. To prevent customers coming back to check on the progress of their commission, I should have taken phone numbers and sent a text when the picture was ready to be picked up. The tooth of the cold-pressed paper is more pronounced than I’d like it to be when mixing watercolours with coloured pencils; hot-pressed watercolour paper will probably be more effective, although this will undoubtedly have an effect on the painting in some other fashion. Dropped into my suitcase at the last minute, the caffeine tablets were a godsend. I’m pretty sure they’re all that kept me upright on Sunday. After the convention, I was so unbelievably tired that I let myself be talked into leaving before I could clear up my space. This was massively unprofessional and I should have been keeping my space tidy throughout the con instead of rushing to tidy up at the end. It turned out that I had no time or pressing need to bring my tablet or keyboard. No digital commissions were asked for (and why would they be, when physical objects are far more desirable? ), I had no time to myself in the evenings and no motivation to do anything art-related on the way home. Keep track of my watercolours. Having to buy a new set three days after buying the first one was painful.